Originally built as a residential block in 1966/69 (architect Toby Schmidbauer), located at Arabellapark, in the Bogenhausen neighbourhood. The studio was established by Italian record producer and performer Giorgio Moroder. Part of the block was converted to hotel rooms for the Olympic games in 1972, and named the Arabella Hotel (some rental apartments and offices remain). In 1998 it was renamed Arabella Sheraton Bogenhausen and should not be confused with the Arabella Sheraton Grand Hotel (run by the same company) across the street. Place In Deep Purple Story: Deep Purple, Paice Ashton Lord, Ian Gillan Band, Whitesnake and Rainbow all recorded at Munich's Musicland Studio, located within the "Arabella" hotel (now part of the Sheraton chain). Hence the PAL song. Important Deep Purple related releases recorded there include Stormbringer (August 74) / Ritchie Blackmore's Rainbow (February- March 75) / Come Taste The Band (August 75) / Child In Time (Dec 75 - Jan 76) / Rainbow Rising (February 76) / Whitesnake (September 76) / Malice In Wonderland (September 76). It was also home to many other bands, including T.Rex, Led Zeppelin and Queen. Viewing: Musicland Studios closed their Arabella Hotel based studio at the beginning of the 1990s, because the nearby subway train was affecting recording quality. There are views of it, both inside and out, on the PAL DVD. Location: Use the Munich metro train, line U4, Station : Arabellapark (terminal stop). Place In Deep Purple Story: It was here that Jon Lord's 'Windows' album was recorded, on June 1st 1974. He and Eberhard Schoener had performed a concert in Munich in 1973 and were asked to write a new work to be performed at the hall. This was recorded and filmed live and issued on album later that year on Purple Records. The album is available on CD on Purple Records and a DVD of the performance is also planned. 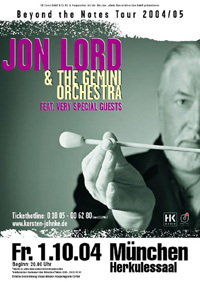 Jon Lord performed again at the hall during his solo tour of Germany on February 6th 2005 promoting his album 'Beyond The Notes'. 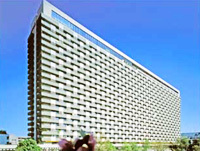 Viewing: The exterior can be viewed from the street. We have no information on access inside. Location: Use the Munich metro train, line U3, U4, U6. Station : Odeonsplatz. Picture: Entrance. Courtesy Ralph Grille. Text: Ralph Grille. Place In Deep Purple Story: The Munich authorities have taken imprints of the various entertainers and athletes who have performed at The Olympiahalle. Deep Purple stuck their hands into wet concrete while playing there in Feb. 2006. Viewing: Can be viewed anytime outside the hall. Location: Use the Munich metro train, line U3. Station : Olympiazentrum. Picture: Courtesy Ralph Grille. Text: Ralph Grille. Place In Deep Purple Story: This modern multi-purpose venue was built at the start of the seventies, and Deep Purple were the first band to play there on January 21st 1973, the final Mk 2 tour. The group have played there on a number of occasions since, including the Rapture Of The Deep tour on February 18th 2006. Viewing: The exterior can be viewed from the street. The picture shows the West Entrance. Place In Deep Purple Story: A few Deep Purple artifacts including a Fireball album sleeve signed by Roger Glover (shown here). It's got loads of material on rock music so worth a visit, and as the tower is over 270 meters high, gives a good view over the city. Viewing: Check for opening times with local tourist office.